Birdshot is just for Birds! “Lights Out” Now available on Amazon. Reply: "Wife does not Buy In‏"
Happy new year everyone, hope everyone is starting this new year full of joy and hope. Take care my friends and God bless you all. Sorry to hear about your recent power outtage! Luckily, you are well prepared for such scenarios - I know people who literally wouldn't know where a flashlight was in their house if power went out. I am a fairly new reader of your blog, and have recently purchased and read your book. It has been very valuable for my family and I and our preparedness will be at a much higher level because of it. Thank you Glad to see you're moving to Texas. The United States certainly has its problems, and the political direction we're heading in is downright frightening, but it's still not anywhere near to the level of your descriptions of Argentina, so Texas should be a pleasant change for you and your family. I'd like to talk to you sometime about doing some consulting on a film project of mine. I'm a filmmaker, and am in the process of selling my first feature film and preparing my second. The first film was a horror picture, and the one I'm preparing now is the true story of an incredible escape from a Soviet prison camp after World War II. It's based on a book that we now have the publishing rights to, as well. But after this, I'm looking to do a picture based on some sort of societal collapse - only more along the lines that you describe, and not so much full on into the Mad Max type scenario. I think the Mad Max/"Road"/"Book of Eli" vision of post-apocalypse is fun, but it's also fairly standard by now, while the real life versions of such things are just not represented well on film. It's hole that might be interesting to fill. of ammo or learn to reload, or is there a real benefit to training with a .22 conversion system that I'm not seeing? Is it worth training with something that's not the real thing? Or should I just opt for a stand-alone .22 pistol? This one comes with a rail system and a red dot. Think I can get him down to $565 with FTF, but have to work out the shipping, etc. as he's farther. Rails allow mounting of scope on top without losing zero. Comes with red dot scope. Again, no side-folder here, and not sure if it would be legal to add it without adding a bunch of new American stuff to comply with the law - not sure. This was made by Century Arms, and I know that's very hit or miss. Sometimes you can get a really lose mag well, or you can get canted sights. Sometimes they're great. You just never know. This has the side folder, though, and if I can snag this at auction for $400 or so it may just be worth the risk. Anything here I should be looking for? Which would you pick? Again, thank you very much for your blog and your book - I look forward to reading more, and perhaps having you consult on my upcoming film in a year or so, if you're interested. Hi D, thanks for your email! Sounds like your work is lots of fun. Oh yes, couldn’t agree with you more. Though I like Mad Max type movies, it would be nice to see something more realistic for a change. Seems that its either Mad Max / Book of Eli type (excellent movie by the way) or complete wimp getting caught during a disaster and the guy hasn’t got a pocket knife, not even a Swiss army knife, let alone a multitool, a simple keychain LEDt, or God forbid, an evil gun. And if there’s a gun the guy is either Bruce Willis diehard hero or again, clueless dude and the lesson of the movie is that guns just makes things worse. I’d sure like to watch a SHTF movie with a person that has some basic firearms training along with common sense for a change. Your Glock 19 is an excellent weapon. Know that 90% of people worth listening to will recommend you some type of Glock (often 19 or 17) and carry one themselves. Is the standard by which other guns are measured. New guns coming up they all look to replicate what the Glock already does. The 22LR conversion kits are a good idea for cheap training and it is possible to some level once you find a load that works well in your conversion kit. Having said that, for defensive gun classes, I’d invest in proper ammo to make the most of it. 9mm is cheap enough if you buy bulk online. Some of the most serious shooters, they either reload or buy bulk when they find good deals. This is what I would do and you do save money as well as keep a nice supply of ammo at hand. Too bad they don’t sell bulk ammo like that in my country. Depending on how much you shoot and enjoy it, people end up buying a 22LR for cheap plinking. 22LR is also a practical utilitarian round for pests, plinking, as a trail gun or for killing livestock. You can get a WASR10 and 1000 rounds of ammo for $500 at J&G sales. If you want something sturdier, get the Yugoslavian underfolder. If you end up shooting a lot, 5.45 ammo is cheaper and you might want to get a Polish Tantal. These are cheap and ammo is cheaper than 7.62 as well. I prefer 7.62 though for defensive purposes. With soft point ammo expect it to perform like a 30-30 out of a lever action carbine. These would be better options than the ones you’re checking. As for optics, I’d learn to run the AK as is. Later if you want to add one, go for a simple Red Dot scope, forward mounted in a foregrip rail. In terms of guns, you’d be pretty well set with your Glock 19 and one of the AKs. Of course you'll need at least 7 mags, but AK mags are cheap. A vest or shoulder bag to carry them and the rest of your gear. A messenger bag can be fitted with some other emergecny gear to make it a bug out bag or survival kit. Hey, if he’s buying guns, good for him. Hope he learns how to used them too. If nothing else, I appreciate the fact that he had the balls to say was he’s doing and not afraid of the PC cry out. Every public figure that comes out of the closet (or the bunker :-) ) does a favor to the rest of us. He's also taking daily bikram yoga sessions, and learning Krav Maga, a deadly Israeli combat technique taught to high-powered special ops. OK guys, seems I’m buying one similar to this one. Also 9kva. but it levels as low as 150V back to 220V with a 7% error margin. This will make summer much more tolerable and not risk ruining my electric stuff due to low voltage. Don, thanks for the refrigerator tips. One thing I learned is important for “cheapo” blackout solutions, at least when it short term blackouts, is elevating the amount of cold mass in the refrigerator before lights go out. Every empty space I have in the fridge or freezer I fill with water bottles. Once these are cold or frozen it keeps the space cooler when power goes down. If the power goes out for longer terms, I move some of the frozen water bottles and gel packs (yes, I have some of those too) into the lower drawers of the refrigerator, put the food I want to keep cool there and cover it with towels and plastic. This is basically a version of the old “ice box”, back when there was no power and the ice man left you a chunk of ice to keep food cool. The better insulation the longer it lasts. This works ok for 24 hs or give or take. At the same time, I’m also storing water and once the bottle of water is no longer frozen you can drink nice cold water during the blackout. This is a very cheap solution for short term blackouts. For longer ones you of course need a generator, but these are still things that can be done right away for no money. Well, power is back up but, maybe as a metaphor of the entire country, you have power but it doesn't work well. Instead of 220V, we have 170V and that means the energy efficient lamps I have work, so does the TV and computer, but the microwave doesn't work, nor does the much needed air conditioners. The fridge is barely working and not cooling well. I'm going out to buy an automatic voltage elevator, this will elevate the output back to 220V, even if I only get 170V. Playing it safe I'll get the one that elevates as little as 150V. Summer has just started and January promises to be hell here in Buenos Aires. Why do we have these problems? The electric infrastructure is old, in poor kept condition, and proper maintenance was never done, let alone after 2001 when they just duct-taped problems. As more people move from the provinces to Buenos Aires or come from north of the border (Bolivia, Peru and Paraguay are our version of Mexico) the problem gets worse. Where you used to have a house you now have a 15 story building. Where you used to have land filled with trash or a public park, you have squatters building shanty towns that go up 3 or even 5 floors, hooked illegally to the electric power and not paying a cent of course. Hope I can find a solution to this problem soon. Take care folks. Yesterday I finally ran out of luck. I’ve been hearing stories of people nearby going without power for 24 hs. or more. Even worse, some people have been without water for over a week! I’ve been dodging the blackout bullet so far, at least until yesterday around 8 PM. 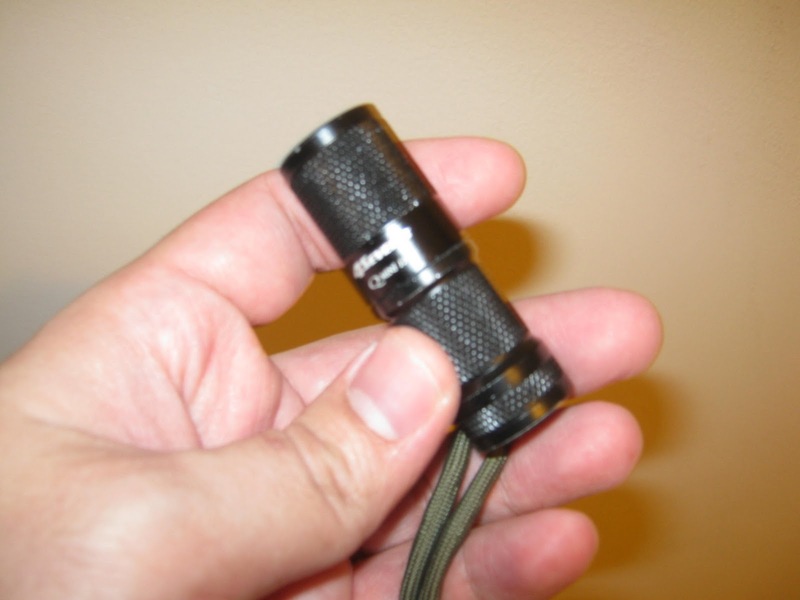 The Quark Mini123 is small, but it packs a lot of lumens. I was on the computer as usual, suddenly it was all dark and my 2 year old son cried out for dad. My oldest one being eight is already used to this and he just stayed with his brother telling him everything was ok.
On top of my desk I had a plethora of preparedness stuff: An emergency bandage, Celox gauze, ammo, a box of 12ga buckshot, a couple lighters, half a dozen knives and about the same number of flashlights all just a few inches away. I don’t believe many people have the problem of thinking “Darn, which LED do I pick?” when caught by surprise by a blackout. :-) I’ve been everyday carrying the Quark Mini123 for some time now and had it in my pocket, so I decided to use the opportunity to test that. As I got up to go check the kids, my wife was already on the way with a little keychain LED. I twisted the tinny light and the low mode was enough to get around. Its funny but today, there is such a thing as too much light. With a +80 lumen light (give or take) you soon find out that moving around indoors with a LED that is too bright often reflects back to you (specially in white walls) and kills your night vision, makes it hard to adjust to the general low light level again. In medium, the R5 LED provides 40 lumens for 8 hours, and that’s enough to see well. High: 135 lumens... too bright! The Quark Mini123 has low medium and high modes, and if you cycle through it 3 times it goes to the hidden modes (Strobe, S.O.S. beacon) for a total of seven Output Modes: Low: 8 OTF lumens, 150 hours Medium: 43 OTF lumens, 6 hours High: 135 OTF lumens, 2 hours, Special (hidden) modes: Strobe 2.4 hours SOS 7.2 hours Beacon (Hi) 12 hours Beacon (Lo) 60 hours. Putting the kids to bed, washing the dishes, and other chores are easier done with a headlight that leaves both hands free, but the small size of the light makes it very practical none the less. For example, for taking a shower, I just left it on medium mode pointing towards the roof. This light can stand on its tail and that’s a advantage that makes things easier. A high efficiency LED that can stand on its tail can be left safely in a room or corridor to provide lighting. I left a couple AA LED on doing just that on low mode. Again, notice the importance of having different modes and not just a “look, it’s brighter than the sun!” mode. 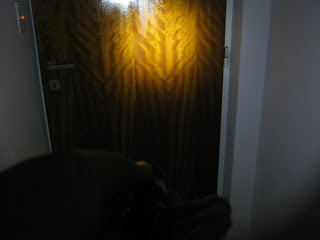 Besides the obvious quality issues, one of the differences I noticed between quality LED lights and cheapo ones is the quality of the light itself. First you have the color. Cheapo LEDs often have an ugly purple/blue tint. Use that during a blackout and it makes it even more depressing. The best Cree LEDs have a nice white color and for that reason most well known brands are using them. Some cheapos also have Cree brand LEDs, but their poor or older drive circuitry makes for a pulsating, uneven light. I realized this before but only during last night’s blackout did I notice how annoying it gets, even makes your eyes and head hurt in the long run. LEDs achieve their low and medium modes by pulse-width modulation (PWM), fancy word for turning on/off very very fast in a way the human eye doesn’t detect the actual strobe effect, but just a dimmer light. If the frequency isn’t properly set the human eye will see this to some point and yes, drive you nuts. The Quarks I own don’t have such problem. 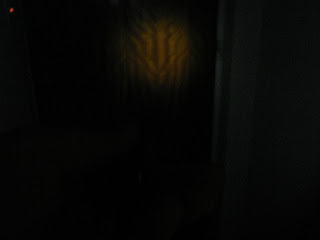 Another thing I like about the Mini123 is that it is a single cell light. I remember in the old days what a pain it was when you only had just one D cell left but the light required two. Sometimes one battery is all you have. Disadvantages? Sure, the CR123A battery. For disaster/emergency use you want commonly available batteries. I’ve got a generous supply of CR123A batteries. Seems that everyone heading this way thinks I can put them to good use so thanks to them I’m in no short supply of the powerful little batteries. Since they aren’t easy to find around here and quite expensive when you do, it’s a much appreciated gift. 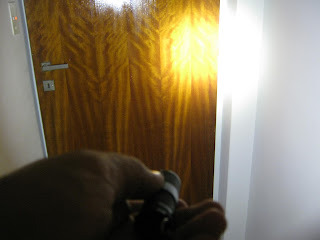 Now, for a real extended SHTF flashlight, you must have AA or AAA lights. Even if you have enough CR123A batteries and even Li Ion ones to recharge, availability is important. I solve this by having a CR123A as my EDC light, but also a AAA Fenix LDO1 in my keychain in case AAA is all I can get my hands on. The second disadvantage I find is that as capable as it is, a tactical light it is not, but that’s something that will be covered in another post. All things considered, I’m happy with my EDC choice. Puts a lot of light downrange, has days worth of light in low mode and you wont even remember its in your pocket until you need it. Some of the latest emails ask about where to get started reading this blog and how things were before it all went down. Also, tips and clues to look after as indicators of a possible economic collapse. There are many ominous parallels between Argentina and the U.S. and the question often asked is can America avoid the economic consequences that Argentina suffered from a fascist government combined with government debt and currency collapse? I believe the answer is likely NO! Down Argentine Way was the 1940 film that made a star of Betty Grable, who played an attractive young woman on vacation who fell in love with a wealthy racehorse owner. The storyline actually reflected a common occurrence during the 25 years prior to the film debut. In the early 20th century, “as rich as an Argentine” was a common expression, often used in connection with poor British aristocrats attempting to marry off their daughters to wealthy Argentinians. Argentina was indeed a wealthy nation; for example, we all know about Harrods Department Store in London. Few realize that during this period of Argentine prosperity, Harrods also ran a store in Buenos Aires. Buenos Aires is still a beautiful and interesting city. If you visit, you’ll learn that despite all the doom and gloom we hear concerning Washington debt and the dwindling dollar, there is life after debt repudiation and currency collapse. The same thing has been proven in Russia, Germany and other nations numerous times. It has even happened twice in the United States. Preparedness, security, guns and calling it as I see it. Today during Christmas lunch my wife’s family dropped by. After giving the kids what “Santa left for them at grandma’s house” and eating we ended up talking about current events during desert. Light was out again at my mother in laws house. Yesterday they spent Christmas eve over at the house of other relatives and power went down there as well. When someone drove my mother in law and sister in law back to their place, they saw that most of the neighborhoods they went by where pitch black. My mother in law told me that this Thursday, they robbed the bank around the corner from where they live. The robbers hit one of the clients and he died of a heart attack. The man died around 10AM. The cops arrived, then the ambulance but since he was dead on arrival and it was a crime scene they left him there in the sidewalk and only picked up the corpse around 6 PM. This type of thing happens very often. Specially with older folks but adults in their 40s and 50s too, they get scared during the robberies and die because of heart attacks. It also happens when they torture people during violent home invasions. The cruelty some people are capable of is underestimated by most law abiding citizens. She also told me of another robbery she witnessed recently. A Toyota Hilux was driving around the neighborhood, smashing display store windows and stealing merchandize. They would smash the glass and cut the padlocks of the rolling grille doors with bolt cutters and steal what they can quickly, then get back in the car and hit another store. During another incident a Bingo joint was robbed. Since they couldn’t get through the armored door they simply cut a hole into the brick wall of the building. What’s the purpose of these examples? It’s the other side of the coin. On one side we have the financial meltdown, with unemployment, inflation and a broad spectrum of situations we must prepare for, but on the other side we have the consequence of the economic collapse, the violence, the lawlessness and crime. Hyperinflation is no joke, you’ve got to prepare for it, you need to know what to do in case that coma moves a digit to the right all of a sudden. I went through that and it does send a very cold chill down your spine to feel the money in your pocket melts like that. But inflation wont kill you. Bullets, fists, knives and sticks (or heart attacks) will. I was just checking a new “Preparedness” website, one of the dozens that have been popping up since “preparedness” went mainstream and is offered like gadgets for perfect abs. Sterile, politically correct, and of course, little or no mention of this side of the coin. These type of emergency preparedness websites and books are almost out of FEMA. They look nice and tidy, (better than my messy blog ;-) ) but you can just see the business guy behind it and how its clearly all about the money and so very little about real preparedness. These marketing type gigs are usually easy to detect. Designed for “click through” efficiency but little content. Same thing for the books. Every possible trick is used to stretch maybe 50 pages of real data into +300 pages. I’ve been applying a little technique lately. Instead of wasting my time I just read the table of content. If the book (or website) even implies that its intended for anything other than wilderness survival and it doesn’t give serious consideration to “the man is wolf to man” problem (Homo homini lupus),I just stop wasting my time right there. The topic is that important, and anyone trying to sell you “preparedness” info but not willing (worried about losing the more PC type market) or capable of covering it due to ignorance of the subject isn’t worthy of your time and money. The marketing textbook basically says to avoid the word “survival”, or even worse, “survivalist”. Preparedness is more politically correct. Avoid mentioning guns, its taboo and will turn away the sector of the market composed of sissies. That may be good sales scheme but it sure as heck is poor ethics. The economic crisis is already alive and well, the social consequence is just around the corner. People will and already are suffering this. You guys see it yourself clearly with all the emails you send me about violent crime, home invasions and other incidents that weren’t nearly as common before. During good times you can afford to say useless BS, but when the chips are down and S really HTF beating around the bush and being politically correct about what’s going on will get people killed. It’s wolves, sheep and sheepdogs out there guys, and this year will bring even more wolves. They are the natural consequence of our times. Just wait until the children of the “new poor” turns into adulthood. Children that saw their parents losing their jobs and not finding one again, saw them drink, commit crimes and go to jail Poor kids that grow up hating the middle class. Just wait until the unemployment checks stop rolling in. The problem is already there, there’s already more crime than before. Just wait a couple more years. Just wanted to say Merry Christmas to everyone of my readers. Hope you had some good times with your family and friends. I really appreciate your support. You guys(and gals) make this blog possible! Thank you all so much for being there. Life in Argentina, 9 years after the 2001 Collapse. This week has been interesting and as I now sit here to write and put things together, it hits me how surreal it all is. You get used to all this, its parts of your daily routine to see this things, avoid roadblocks, avoid the conflict and places where protests and looting are taking place. It does wear you out though, imagine wanting to go home after a hard day’s work only to find this in your train station, closed until further notice. This happened in Constitucion train station yesterday after the service was canceled because of another group of protesters blocking the railroad, and therefore forcing the service to be canceled. I used to take this train to work and this happened more often than you’d think. Man, I don’t miss that train. We’ve also been experiencing a squatters boom. All over the country squatters are taking over land for themselves, hurrying in building brick and mortar structures to consolidate their position. The news only reported the most notorious ones that took place in the capital district, but this situation is wide spread and much worse in the suburbs and country. How does it look when they take over land and start dividing the land among them? It looks like this. No, not pretty at all. Imagine waking up one day and seeing this in the public park in front of your house. Those orange brick buildings that can be seen in the background, some 3 levels high, they build those in a matter of HOURS. In no time you have a favela or shanty town built in your neighborhood. The price of your nice house plumbs and the neighborhood itself become no man’s land a few days later. This last week has been pretty hot as well. The smog and general tropical humidity aren’t helping either. Blackouts have become widespread all over Buenos Aires. My grandmother and aunt, they both live in different locations along Buenos Aires and they both spent yesterday without power. It went out yesterday around 10Am and came back today at around 12 AM. Power has gone down again now. Its clear that the power infrastructure has collapsed and an interesting summer awaits us. Thank God I haven’t lost power once yet, but everyone I talk to seems to have rolling blackouts this past week. My cousin just got divorced and arrived here yesterday from Chile. She was there during the earthquake but what she saw when she came here depressed her a lot. As she arrived, she was welcomed by mad traffic because the traffic lights weren’t working because of the blackouts. To make matters worse there’s all sorts of roadblocks and protests, either because of squatters or neighbors demanding a solution to the power problem. As she arrived to my aunt’s house her little kids asked her to please turn on the lights, and they asked why they were using candles instead. Seems that other than the earthquake, blackouts don’t occur often in Chile. Because of inflation we are experiencing a particular problem as well. There’s just not enough cash to go around. The government doesn’t want to print much needed 500 peso bills because they said it would be admitting an inflation “That doesn’t exist!!” . Add to the rampant inflation the fact that people don’t trust banks much and prefer to use cash instead, this only makes matters worse. In my case my bank has customer exclusive ATMs along with general public ones. The ATM for general public has a line that went for half a block and was quickly running out of cash, the ones for clients were empty. I tried to avoid the poisonous stares as I quickly went to the client’s ATM, got the cash and left in less than a minute while the other guys waited for hours. Retired people waited yesterday under the burning sun to get their much needed cash. Banks said they would open today but at 7 PM yesterday they announced they wouldn’t open the following day. Today, banks are closed in spite of having announced the entire week that people could count on them being opened the 24th. Banks lying to people, big news. It’s a nice warm feeling to know that I have enough cash at hand and I don’t have to go nuts if ATMs go empty, and that the entire country’s banking system can go to hell… again, and my account wont be affected. Have backups to your financial planning guys. What would you do if they don’t accept plastic any more because of blackouts or some other reason? What would you do if ATMs run empty and banks close? These things happen, its just that people prefer not to think about these things. In terms of crime, my wife told me about a new crime she heard while in the beauty salon that I just couldn’t believe. Because hair extensions have become popular, there’s a prime price for nice long human hair! These scum bags are cutting off women’s hair, specially if its nice and already arranged in an easy to cut pony tail. A long pony tail sells for 300 pesos. If the pony tail is 12” long, it sells for up to 900 pesos, that’s almost USD 250. As crazy as it sounds this salon alone has heard of such a thing several times, a couple of their clients already becoming victims. Here’s an article explaining this crime,(sorry, its in Spanish) In times of lawlessness and desperation the most absurd incidents take place. Take care folks, have a Merry Christmas! Knives are terrific tools and the reason why I mention them and review them pretty often is self explanatory for some of you but maybe not for others. Few items are as useful as knives. I use them all the time, from opening letters and packages to cutting meat, or chopping wood. A couple weeks ago I used my fixed blade knife for cutting meat for an asado (Argentine version of BBQ) on another end of the year asado we ended up eating the meat straight from the grill and right on the wood table, no plates. We improvised dinner in the shooting club and we just cut the meat over the wood table soaked in meat juice. Everyone had his knife and showed it around proudly. During our mundane daily chores a folding knife such as the ones mentioned here often does well enough. Just like a pistol isn’t ideal for self defense but portability makes it an essential piece of gear, folding tactical knives aren’t as good as fixed blades but them “being there when you need it” means that’s what you’ll be using most likely. 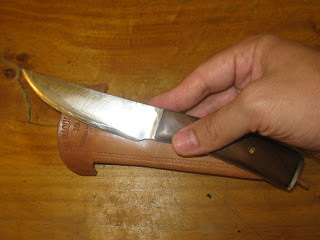 In spite of this, fixed blades are of course more rugged, more comfortable to use and can have larger blades. When I’m traveling, going to the country or some other place where it may be of use, I’ll take a fixed blade along with me. If anyone remembers the gear pic I took from my trip to Uruguay, in that occasion I took a Mora knife (excellent tool by the way). Lately, I’ll throw this knife I made in my bag. Can’t explain why, but there’s an extra pleasure in using tools and gear made by yourself. Its also nice to know exactly what to expect from them, knowing the materials you used and what type of abuse they can take or not. In today’s world where everything is so plentiful, an odd contradiction takes place. Just like it happens with guns, those that like knives will usually own MANY of them, more so than they’ll ever need. That’s how you see knife pictures in forums where the knives show little or no wear at all. If you see some of the native tribes in Africa or the Amazon jungle, you see these folks with worn out machetes, they wear them so much its not rare to see a Tramontina machete that has been worn down to knife size. My grandfather left me a small knife he brought from Spain, it’s the only knife that I’ve ever seen that has been completely worn out. The blade was probably 4 inches long when new, now its just 2” and the blade geometry is lost, only the spine is left. Check the above link. You may be surprised to see some knives that look extremely rugged and abuse resistant just snap. Granted, you shouldn’t abuse your knife like that, but what if you don’t have an option? A knifesmith friend of mine, he snapped an 9” D2 steel blade just by chopping on wood. The high end manufacturer quickly replaced the knife with a new one and claimed there was a heat treatment mistake. I wonder how many people out there have that same brand name knife, thinking its capable of resisting great abuse yet that knife may have an incorrect treatment and will let them down when needed the most, even if they don’t abuse it. Use your stuff now guys, learn what it can and can’t take. Check the link above and see how many knives just snap, knives that are thought of as “prybars” by some owners. This guy isn’t fooling around, he not only chops, stabs the knife into wood and intentionally tries to break the tip, he uses the knives to cut concrete, something you really don’t want to do with your knife but who knows? I had to use my knife as a shovel once, dig into the dirt and grit. You do want to know what your knife is capable of. The Best bang per buck according to these tests? Here you go. The most awesome value knife? Priced at only $20 and performing better than others worth 10 times as much and more? The same knife your good old friend FerFAL recommends all the time, the Cold Steel machete. Hope you bought 3 or 4 short Bowie machetes back when I started recommending them, they are no longer offered in 12”. The knife tested is the Cold Steel Kukri. Check it out. This guy hammers the machete into a metal pipe, and the machete holds! Second, the Gerber LMF II this is pretty good value in a nice compact package. Gerber launched the same knife with the Bear Grills name on it, used orange plastic instead of black and added a firesteel… and doubled the price. Glock Knife With Fixed Clip Point Blade Md: KB17278. This one is a classic and in my short list. Everyone that I know of that owns it keeps talking about how tough it is. The Mora got a poor review but common. Yes, it has a partial narrow tang. Yes, you’ll break it if you baton it through a piece of concrete. But use it as knife and for 15 bucks you have a blade made of laminated steel that is razor sharp, light and comes with a good sheath. Only the Gerber costs over 50 bucks, but it does come with a nice sheath that includes a fool proof sharpener. My father sent me this clip. No, my old man is not a survivalist. He’s an accountant that worked in banks his entire life, mostly in top managing positions. I hope more people see this video and finally understand that banks have no problem whatsoever in downright stealing your savings, destroying the lives of millions, killing thousands, they simply don’t care. They did exactly that here in Argentina in 2002, they will do it again. I’ve emailed Alex Jones program before and just did it again. I’d really like to have the opportunity to tell him how your entire world changes when the things he’s talking about finally happen. Your entire world changes forever when a country goes down like that. Take care folks, and don’t trust banks. They sure aren’t worthy of such a thing. solidarity was greater than today. traditions are far from ours. Hi JP, thanks for your email. You can legally own guns in France! Other than that, millions share your same situation, in many cases much worse. Your situation is pretty good and you can do a few things to make it even better like getting a firearm for home defense and stocking up some supplies. Its interesting to hear about your mothers experience. If you have more of those, anecdotes and such I’d like to hear them if you have the time. My grandmother, she went through some tough times during the Spanish civil war. They had a farm but times where hard and food was taken away, rationed. She always wanted to have her own store, a grocery of some sort. “You can always make a living if you own your own business” she says. Many store owners lost their business here after 2001 but I understand what she means. If you are fair, build up a good clientele, have good prices and quality products you’ll manage to survive. When they came from Spain to Argentina my grandmother opened a small general store, then closed it and opened a bakery which was very successful. During war times, bugging in and fighting the hordes isn’t an option. Your best alternative is to evacuate in advance, not wait until its too late. · One of the conditions of the armistice was to pay the costs of the three-hundred-thousand strong German occupational army, which amounted to twenty million Reichmarks per day. The artificial exchange rate of the German Reichsmark currency against the French franc was consequently established as one mark to twenty francs. This allowed German requisitions and purchases to be made into a form of organised plunder and resulted in endemic food shortages and malnutrition, particularly amongst children, the elderly, and the more vulnerable sections of French society such as the working urban class of the cities. · The disorganisation of transport, except for the railway system which relied on French domestic coal supplies. · The extreme shortage of petrol and diesel fuel. France had no indigenous oil production and all importations had stopped. · Labour shortages, particularly in the countryside, due to the large number of French prisoners of war held in Germany. Supply problems quickly affected French stores which lacked most items. Faced with these difficulties in everyday life, the government answered by creating food charts and tickets which were to be exchanged for bread, meat, butter and cooking oil. Hunger prevailed, especially affecting youth in urban areas. The queues lengthened in front of shops. In the absence of meat and other foods including potatoes, people ate unusual vegetables, such as Swedish turnip and Jerusalem artichoke. Products such as sugar were replaced by substitutes (saccharin). Coffee was replaced by toasted barley mixed with chicory. Some people benefited from the black market, where food was sold without tickets at very high prices. Counterfeit food tickets were also in circulation. Direct buying from farmers in the countryside and barter against cigarettes were also frequent practices during this period. These activities were strictly forbidden however and thus carried out at the risk of confiscation and fines. 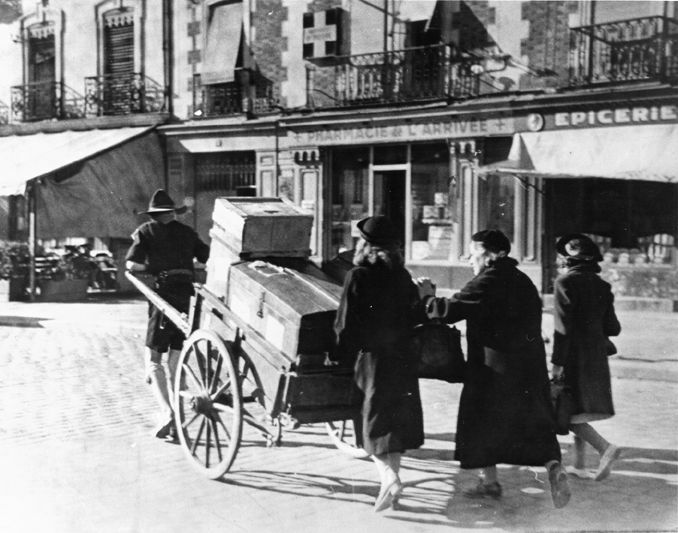 Food shortages were most acute in the large cities. In the more remote country villages, however, clandestine slaughtering, vegetable gardens and the availability of milk products permitted better survival. Ersatz, or makeshift substitutes, took the place of many products that were in short supply; gas generators ("gazogènes") on trucks and automobiles burned charcoal or wood pellets as a substitute to gasoline, chicory took the place of coffee, and wooden soles for shoes were used instead of leather. Soap was rare and made in households from fats and caustic soda. When leaving the country your documents to do so and you savings in precious metals and cash will become your greatest assets. The more money you have saved, the easier it is to start over abroad. Ethnic and religious persecution has occurred throughout history and still occurs today. When you see such a thing happening, leave immediately. Being a second to later may have terrible consequences. First, let me thank you for the great blog and the hard work that goes into it. I have been following it off and on for about a year & 1/2 now but have become more a regular reader since I feel that the rumblings of civil unrest here in America are becoming more frequent & increasing in volume. Having said that, I am your typical American suburban dad with wife, kids, mortgage, etc but have my eye looking years down the road. I agree that one should have physical gold in their possession for when the SHTF. Not being an expert at all on what I should be paying for gold in pawn shops but more comfortable with buying coins, what are your recommendations for acquiring gold coins? I fear that if I go to a coin dealer or some type that I will be paying too much. Again, thanks for your time and your blog. Thanks Adam for your email, unless you have someone you trust to deal with, I recommend buying on line, check out Apmex, they are the better known dealers as far as I know. If you’re on a budget you might want to buy silver instead. It will depend on the budget you’re dealing with but even one or two silver eagles a month adds up quickly. Stick to gold and silver American Eagles, but if you find other good offers such as Krugerrands, Mexicans, Maples leafs or Pandas at Apmex go for it. Even if you buy gold, you will want to put some of that money into smaller denomination Silver Eagles. Some pre-65 dimes as “change” isn’t a bad idea either. For the bulk of your precious metal savings, go for gold eagles if you can afford it. Of course before putting money into precious metals you should have the basic gear and supplies often discussed here. No point in stocking up on metals if you don’t have enough food to deal with disasters, including economic ones. A year worth of food for your family translates into a lot of peace of mind. A couple weeks worth of water already stored and means of purifying more. Camping gear, lighting, heating, cooking, first aid kit and at least one handgun for defense. I love doing what I do. Constantly learning and researching survival and preparedness opens a fascinating world of possibilities. From training, meeting people, to studying, I just love it. There’s hardly any skill or field of knowledge that can’t be associated to survival and preparedness in one way or another. If I’m talking with a machinist or blacksmith I’ll ask about metal types, if it’s a doctor there’s lots to learn from him, from first aid to human anatomy info that can be used in fights, if it’s a pilot I’d ask about emergency procedures, types of accidents and so on. If its an economist I’d like to know what he thinks about the current situation. If its just an average Joe driving me somewhere I may learn about his life experiences as well, like I did today. In many ways, at least in my opinion, survival is about exploiting your potentiality of what you can be as a person to its maximum. I’ve heard people telling me “You can’t own a gun. Isn’t it illegal in Argentina?” Yes, you can, and no, its not illegal. (but notice how the person creates a limit to what he can and can’t do before even knowing if that limit even exists) “It’s not safe to own guns! You’re not a cop!” An Argentine cops fires 25 rounds during his entire training, I fire 500-800 rounds per training course. These are just examples of things we’re supposedly not capable of doing but we really are if we make the effort. You can train, you can learn, you can masters skills, and you can mold your life to be anything you want, the limit is mostly mentally. Looking for information on how to properly perform a roll I came across Parkour. I’ve heard about it before of course, but never really looked into it. One of my life maxims is from “The Little Prince” and that’s to never let a question go unanswered, never let pass the opportunity to learn something new. In this case I didn’t know the first thing about Parkour (PK), only what I saw on a TV report once, mostly some kids jumping buildings. My first thought was “yes, pretty silly to risk your life that way”. Turns out there’s a lot more to PK than just Hollywood stunts. Parkour is the art of moving from one point to the other overcoming obstacles, most often urban obstacles, in the most efficient way possible. In a more advanced stage it leads to pretty impressive acrobatics, often seen in movies where there’s chase scenes. Casino Royale, Bourne, Die Hard 4, the last Hulk movie, there’s hardly a big box action movie these days without Parkour scenes. But this is only the most advanced, most acrobatic part of it, there’s a lot more that while not as flashy is still pretty useful, useful enough that the US Marine Corps are incorporating t to their training. Jumping from one building to another may not be your idea of fun, but there’s still a lot you can do without risking your life and even a little PK may come in handy. From what little I have seen, climbing walls, jumping and learning how to fall from high places, dissipating the energy so as to not injure yourself are among the most useful techniques. Here’s some PK clips. Of course a good fitness level is needed, but some of the basic moves aren’t that demanding. OK, now that everyone saw that and though “I’ll never do that”, here’s some basic stuff everyone can start with and is still pretty useful. I’d be happy with some basic precision jumping, lazy vault, jump and roll, learning how to fall and climb a wall. A little Parkour may go a long way when being chased, avoiding obstacles after a disaster, and of course its great fitness workout. Interested? Find people to PK with near you. I'm a bit behind on reading your blog, but I think I can help out a bit with your review of ear protection. I am in Afghanistan as a forward air controller - a job that requires us to be able to hear radio comms, maintain situational awareness, and not go deaf when shooting. We use both Peltor products mentioned in your previous post - both the headsets and the earplugs (or similar military versions). Lots of guys love the Peltor headsets . They have external microphones on both sides to maintain stereo hearing. They protect your ears well. You can get them with a mic/speaker so you hear radio traffic inside the headset. The major downside, and the reason they mostly sit in my tent, is that they're uncomfortable. Your ears sweat, get sticky, get dusty, and after a while they just plain hurt from the gentle squeezing pressure on your head. This leads to spending more time worrying about your headset than your job. I've seen lots of guys constantly fidgeting or readjusting to reposition them, or worse, removing the headsets and their helmets at every opportunity. They also use batteries so there's a major failure point. You need to turn them on and may need to adjust the volume. In a home defense situation where you need them to work right now, there's a good chance they will require some fidgeting to become an asset rather than a liability. It's not the time to be changing batteries, adjusting volume, or trying to find the 'on' switch. For missions where you set them up, put in fresh batteries, adjust them, ops check them, and then go out into the world, they're fine. For quick response, like home defense, they have their limitations. Because of these shortcomings, I keep a set of those yellow/green Peltor earplugs handy. You can get a little hard case designed for them that clips wherever convenient. I keep one set on my body armor and another set in my ruck. The key advantage is that they're always there, and they always work. When there's a situation, and the last thing on your mind is ear protection -- they're right there but out of the way. When a .50 cal starts shooting 4 feet away and suddenly ear protection becomes a priority, they're right there. As far as hearing protection goes, the earplugs are effective. I've put thousands of rounds of 5.56 and 9mm ammo through weapons while wearing them, and my hearing is still fine (annual hearing test). A .50 cal is loud no matter what ear protection you're wearing, but with these the noise is not a huge factor. The earplugs are also fine for long wear. I've worn them for hours at a time while running around, crawling and shooting and they stay in place well. They do stick out because they're double sided, and can get dislodged by the straps on a helmet if you put the earplugs in first and then put the helmet on. You can't really see it in pictures, but the yellow side of the earplug has a little hole through the center that allows you to hear conversations and ambient noises. The other side is solid to block more noise, but either way they do a good job against loud, sharp noises like gunshots. In training I'll generally pop one out between shooting to hear the instructor better, but it probably isn't necessary and you can still hear range commands and tactical comms just fine when they're in, even using the solid/green side of them. Anyways, I highly recommend the Peltor earplugs. For $10-15 order a set; the only downside will be the day you inevitably lose one and have to get more. They're far more tactically useful than regular foamy earplugs, but still compact and simple. If you're only going to fire a few shots, like a home defense situation, you probably won't even think about hearing protection. For any longer engagement, after the first few shots, you will be thinking "crap that was loud I wish I had some ear pro" and in those situations these earplugs are the way to go. They're always there, and, tactically speaking, they're far better than going deaf or sticking your fingers in your ears. Hope that's useful for you. Thanks a lot Tim for your review. Sounds like Peltor Combat Arms earplugs are a good choice. They seem to do all right based on what you say and the reviews in Amazon. According to Peltor, the olive end is used for ordinary indoor range shooting, and the yellow end is used outdoors for noise-activated protection up to NRR 22dB. The power of the internet is terrific. I knew right away that I’d get several “Birdshot if for little birds” and “look at the Box of Truth” comments when I posted about shotguns. Guys, a couple things. The Box of Truth is fun and interesting, the name itself implies fact. The real truth though, is that The Box of Truth is just a couple guys that have fun shooting stuff, seeing how much sheetrock or bottles of water it penetrates, that’s as “scientific” and “Truthful” as it gets. That X caliber fired out of Y weapon penetrated Z amount of objects when fired from B distance is as far as it gets regarding facts. Everything else is pure speculation by the authors. Wrong. It only means that a specific gun firing a specific type of 22LR penetrated 6 sheets of sheetrock. That’s it. The equivalent of 3 interior walls is a grotesque simplification and it’s the readers fault if he assumes these are facts. In my case “interior walls” are made of ceramic brick and mortar. 22LR will barely scratch it. 38 Special 158 gr Winchester whitebox soft points out of a 3” barrel revolver will penetrate one side but stay inside the hollow ceramic brick, not exiting through the other side. Yes, I know that for a fact in my particular interior walls. “That’s not true! The BOT says it will go through at least 3 walls and…” The guys from the Box of Truth shoot stuff and that’s it. I don’t like when they make generalizations such as the one mentioned above because they give people the wrong idea. It would be more serious in my opinion if they stuck to the facts alone and leave the assumptions of how much real walls it would penetrate or how it would do against people to people that do such research. It gets even worse when they start speculating about how calibers will perform against humans. Birdshot is for little birds? Right. And 375H&H is for Elephants yet it will kill a human just as well. Wait, don’t even say it. Before you write a reply I have another little fact for you: 223 is a VARMINT caliber, for ground squirrels, gophers and crows (isn’t that a “little bird?”) yet 223 (5,56mm) is used all over the world as an standard infantry caliber. It not even legal for big game hunting in many parts of the world. Think about it. Its not considered legal for hunting unarmed 100 pound mammals in my country, yet it is used by the military world wide. So give of take the silly “birdshot” packs at least 6 times as much power as 45 ACP. Now, its is true that this holds true at very close range. Given that the average range of engagement is 6-7 yards, it is VERY safe to say that at indoor ranges as long as you do your part (hit where it matters) that “birdshot” will to its part. I remember a friend of mine from school. She was about 10 years old, petite little thing, and during a camping/hunting trip with her dad, her dad shot her with his birdshot thinking she was an intruder. The range must have been considerable because the pellets spread along half her leg and this was a hunting shotgun. The scar left was gruesome but she did survive. Birdshot will not penetrate enough for defensive purposes after 15-20 meters (depends on shotgun, load and choke). At 6 yards? This girl would have lost her leg, ripped off her body. Don’t take everything you see on the net as absolute truth written in stone, even if its called “The Box of Truth”. I’ve read that website for years and greatly enjoy it and I’ll keep reading it. There’s absolutely nothing wrong with a couple retired guys shooting stuff and having fun. They do sometimes makes inaccurate generalizations but that’s the readers fault, its up to you do read, research and come to your own conclusions. Myself, I’ll take the word of the guy that shot a significant number of bad guys with that round and saw the outcomes of countless gunfights over the assumptions of people just shooting sheetrock. I take what I already know about the round, do a bit of research and then make my own conclusions. My conclusion is that at 6 yards or less, that “birdshot” will put the bad guy down if you hit him in the torso/head, but as always, I also expect to need a quick follow up shot. At two or three yards, there will be little difference between birdshot, buckshot, and slug. Why even consider birdshot? Because at very close range it will still work just as well, but it has two advantages: 1) Less penetration in indoor sheetrock walls 2) Less chances of serious ricochet wounds. If you have sheetrock walls, buckshot will go through and is more likely to seriously injure people on the other side. If you have solid walls it may change trajectory back towards you or towards innocent people. That’s why in training you use birdshot. These aren’t a concern for you? Go straight for buckshot. I’m simply explaining why some people have a shell of birdshot as their first load, based on their circumstances and locations. But please, don’t repeat inaccurate statements such as birdshot is just for little birds. Its as inaccurate as saying that 223 is just for ground squirrels. "In fact, tests have shown that even #4 Buckshot lacks the necessary penetration to reach the vital organs. Only 0 Buck, 00 Buck, and 000 Buck penetrate enough to reach the vital organs." Unless you plan to shoot some morbidly fat circus freak, #4 buckshot will reach vital organs and will most likely kill you. In fact, this is the load of choice the instructor I mentioned earlier keeps ready for home defense.